Cliftonville and Glenavon have been involved in a player swap deal ahead of their Premiership game at Solitude. Midfielder Ciaran Caldwell has moved from Cliftonville to Mourneview Park while striker Tiernan Mulvenna goes in the other direction. Glenavon's James Singleton is injured and misses the match along with Cliftonville defender Eamon Seydak. "They've quality players and strength all over the park - it should be a good game," said Reds boss Tommy Breslin. The champions are level on points with early pacesetters Ballymena United, who top the standings courtesy of a superior goal difference. 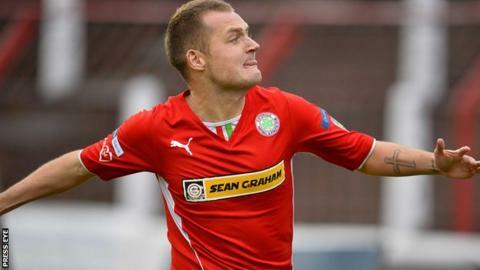 Champions Cliftonville take on Glenavon in the feature game on Saturday Sportsound, presented by Michael McNamee on Radio Ulster from 14:00 BST. Joel Taggart will be on commentary at Solitude along former Glens player and manager Scott Young. Table-toppers Ballymena United travel to Dungannon Swifts with Michael Hammond and Bobby Carlisle taking you through the action at Stangmore Park. There will also be reports from the other four league matches. The Sky Blues have Gary Thompson and Tony Kane back from suspension for their visit to Dungannon Swifts while Kyle McVey will have a late fitness test. Dungannon will be without David McCullough (wedding) and Jamie Douglas (hamstring) but David Armstrong returns from a ban. Institute sit mid-table on their return to the top-flight and boss Paul Kee is relishing taking on big guns Linfield at Drumahoe a week after hosting Cliftonville. "This is what it's all about - this is why we worked so hard to get into the Premiership," said Kee. "You might as well enjoy these occasions although we need local support to push us on to get the points we need to stay in this league." Portadown could bring in Michael Gault for the Shamrock Park clash against Crusaders, with the former Linfield midfielder available after serving a ban. Hamstring injuries leave Keith O'Hara and Tim Mouncey as doubts while the Crues welcome back Chris Morrow. Ballinamallard return to Ferney Park after work was completed on the ground and they seek their first win of the campaign against Glentoran. Injured Mallards striker Jason McCartney faces up to four weeks on the sidelines while Glens defender Willie Garrett (knee) is doubtful. Ruairi Harkin is back in the Coleraine squad for the trip to Warrenpoint Town and he is likely to come in at midfield in place of the suspended Joe McNeill.